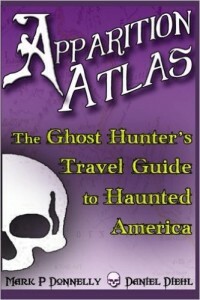 It’s a little difficult to explain to our readers exactly what we mean when we say that our latest non-fiction book, Apparition Atlas is a Ghost Hunter’s Travel Guide to Haunted America. The easiest explanation is that it is laid out a lot like any travel guide published by the major travel companies such as Michelin or Fodors, except for the fact that instead of describing and rating hotels, motels, B&Bs, restaurants and other tourist facilities, it guides the reader to more than 200 publicly accessible haunted houses located in all 50 states. Like any good travel guide each site is described – both its history and current operation – and contact information is given to ease the traveler in locating, and making arrangements to visit, each particular site. Additionally, in the same way that the people at Michelin rate restaurants and hotels by granting them anywhere from one to five crowns, we rate the ‘fear factor’ of our sites by granting them from one to five skulls. We believe that this will help prepare our readers for how likely they are to be freaked out by what they just might encounter on their travels. To enlighten you as to just what these entries look like, here is one sample page from the more than 200 included in Apparition Atlas: The Ghost Hunter’s Travel Guide to Haunted America. Joe Lee Allen made a lot of money. Parlaying the modest profits from a livery stable into ever more businesses, his natural business acumen eventually brought him ownership of a hotel, a private school, and an automobile dealership. He also became president of a bank and the president of the Southeast Arkansas Fair Association. Inevitably, with success came a big, showy house. In 1905 Allen built a residence suitable for a hugely successful businessman and his family. The family in question included Allen’s wife and three daughters, Lonnie Lee, LaDell and Lewie Manker and their father doted on every one of them. While Lonnie Lee and Lewie Manker’s lives turned out fairly normal, poor LaDell’s slowly fell apart. After a disastrous marriage and a nasty divorce followed by the death of father, Joe, LaDell experienced the onset of a serious drinking problem and took her young son home to Monticello where she moved in with her widowed mother. A few years later LaDell’s son died of pneumonia and his mother slipped deeper and deeper into alcohol-enhanced depression and, on the day after Christmas 1948, she drank poison. Grief-stricken, her mother eventually sold the big house and the new owners subdivided it into apartments; and that’s when odd things started to happen. For the next three decades tenants complained of hearing and seeing strange things in the house including the ghostly form of poor LaDell wandering aimlessly up and down the halls. Since then the list of phenomena has only increased. There are footsteps, moans, shrieks and other eerie noises; there are cold spots and the furniture randomly rearranges itself, apparently at will. LaDell has appeared as a reflection in several mirrors – looking back at startled people expecting to see their own face, and her image has shown up in random photographs. There have been apparitions of various nonexistent people staring out of windows and spirit children have been seen playing throughout the downstairs rooms and hallways. The Allen House is now a private residence but the owners graciously open it for tours by appointment only. Every October a recognized paranormal group hosts a dinner and ghost hunt at the house. See below for contact information. Tours of the Allen House are booked year-round by appointment for groups of six or more people. The Allen House is also open without reservation or minimum number of persons on Oct. 30 & 31 from 6:00pm – 11:00pm for tours. Admission fees apply.